[Main image] Authorities investigate the scene where Stephen Finson was found dead Feb. 24, 2014. [Inset] Arturo Lopez and victim Stephen Finson. LOS ANGELES – A state appeals court panel Tuesday reversed a Lancaster man’s second-degree murder conviction for the shooting of an all-terrain vehicle enthusiast in the desert nearly five years ago. 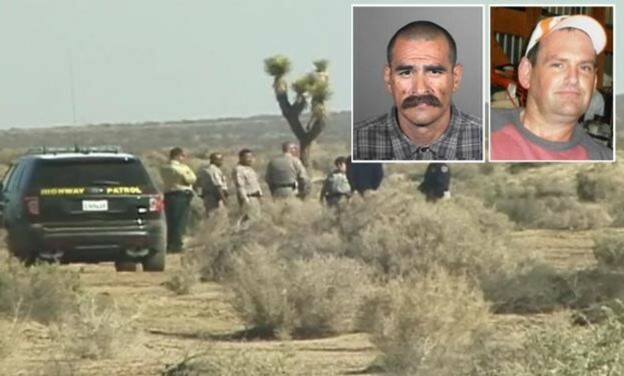 The three-justice panel from California’s 2nd District Court of Appeal ordered the case against Arturo Lopez to be sent back for retrial on the murder charge stemming from the 2014 slaying of Stephen Finson, 47, of Lancaster. Finson was shot to death Feb. 23, 2014, while riding and taking pictures in the desert. He was found on the ground near his ATV in the 13300 block of East Avenue H, about eight hours after his wife reported him missing. The appellate court justices found that the trial court had erroneously instructed jurors in Lopez’s trial on two theories of guilt — one which was legally correct and the other which was legally incorrect. The panel also reversed Lopez’s conviction for offering false evidence, but upheld his conviction for one count of conspiracy to destroy evidence and three counts of possession of a firearm by a felon. Lopez was sentenced in August 2016 to 45 years to life in state prison for the killing. 26 comments for "Man’s conviction reversed for ATV rider’s killing in the desert"
Have they scheduled Art Lopez for retrial and when is it to take place. This is complete BS . This P.O.S. should have been hung 30 days after the trial. Anyone with any intellectual integrity that is not disingenuous knows exactly what this case is about: Vile Homie killed the guy and he tried to cover it up. Now we have a liberal group of judges doing what they do best…demonstrate that they are activist thug huggers finding loopholes. End of story…..and I know the empty headed Tim Scott will have to put his/her two cents in as he/she lives on this board opining on everything and like a little bird leaving his droppings everywhere. Unfortunately this a is a true ‘rule of law’ in this case about the definitions that were spoken. Hopefully at the retrial no more mistakes are made, and the new jury put him back in. You guys crack me up with all of your “Tim Scott this” or “Tim Scott that”.. maybe Tim Scott wouldn’t have to put his “two cents” in so much if you all weren’t popping off like a two dollar shot gun so much. its simple…. If you want to stop hearing from Tim Scott, then stops being such douche bags! He bout to be out, no problem wit that. There is a problem with your attitude Mikey. I sure hope so Mikey. This is on the trial court. There are not any excuses for these types of errors. They will ether try the case again or offer him a plea deal for a reduced sentence. For now he still has time to do on the other charges. I suspect he will die in prison or be very old by the time he gets out. It’s pretty simple. It has to operate in accordance with the law, no mistakes allowed. Unfortunately, a mistake was made so the trial has to be redone. In the final outcome it is almost certainly not going to make any difference, but it is a crappy deal. Sorry. So now Steve’s family has to go thru another trial? Unbelievable! So unjust and unfair for the Finson family!!! Steve came to my house about a month before he was killed and cut my tree. First time I saw him since the 80s. A month later he was gone. Did nothing to deserve this. Just taking a joy ride in the dessert. This POS that killed him should be dead. JUSTICE FOR STEVE!!!!! What the hell is THIS? He was my neighbor growing up. This POS should be doing life and never get out. or you know, the rule of law. if there hadn’t been an error in the trial court, the dude’s conviction wouldn’t have been reversed. blame the prosecutor or judge for the screw-up. True justice for Steve will come when you people go to the polls and vote out all the liberals who now run California!